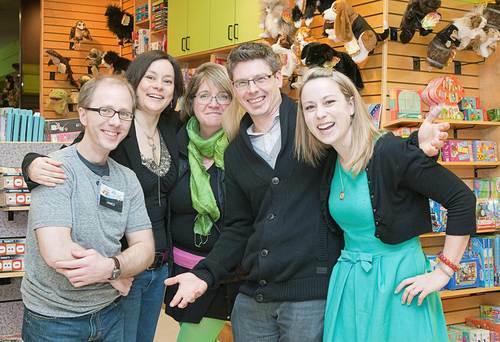 I first met Meg and her husband Don while working at Kidsbooks back in 2007 (or thereabouts). She came into the store while I was working, and introduced herself to me as an author researching what would soon become her YA novel, Porcupine. At the time, I had no idea that Meg was an actress and to be honest have always thought of her as a writer first. I told her that I, too, was an author and convinced her to join CWILL BC, an organization for British Columbian authors that I was president of at the time. Eventually I discovered her work as an actress, and am a fan of her role in Bomb Girls. The best roles I’ve seen her in, however, is when she does a live reading of her books. Truly amazing talent. This is why when Meg has a booklaunch, I make it a priority to go. One of my fondest memories is at a writing camp where she, myself, kc dyer, Lee Fodi and Kallie George all taught. Don was there as well, and we had this super fun week of teaching and hanging out. If you aren’t familiar with any of those names, click the links and read their books! While I could write about how Meg mesmerized the audience, or how her tales of how she was inspired to write inspires her readers, I think this post is more about the realization of how important kindness and genuineness is. When you read A Taste of Heaven by Meg Tilly, I want you to remember that you are reading a book by someone who inspires the best in all of us. And when you are done, you, too, will be one of the inspired.